You’re starting a new business or brand. You want to ensure the name is not already in use. What do you do? Back in the days of PI (pre-Internet), you’d check registered company names, trademarks etc. But in these days of PI (pervasive-Internet), you start by checking for existing domain names. But it shouldn’t end there. I’ve been through that process perhaps 7-8 times in recent years (for myself or clients) and it’s a hassle. Usually, I have five or six ideas for a brand, and have to do all that checking for each potential brand name. And even then, it’s an incomplete check: there are hundreds of other sites where you can create branded accounts, but who’s going to bother checking them all? Well – in future, I would! I know perfectly well that, whenever I have a problem or there’s something I want to achieve online that isn’t weirdly abstruse, there is always a product or a service tailor-made to my needs. That’s where we are at on the interweb these days. You can search the 25 most popular social sites and key domains all in one go. And if that’s not enough, you can also search 500+ more sites. It’s brilliant – and best of all, it’s FREE! And if you’re keen to grab your brand everywhere that counts, they offer a service to create the accounts for you – a great time-saver! I don’t have any plans to start a new brand at the moment, but I’m almost tempted to start one just to use Knowem in earnest! 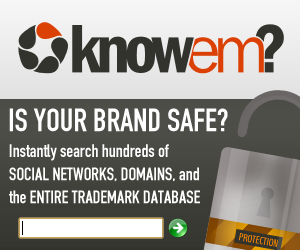 If you’re starting a new brand and find a name and test it using Knowem – let us know in the comments section – but perhaps it would be wise to do that AFTER you create your social accounts! BTW – are you registered to receive my newsletter and get updates of new posts? If not, use the optin box on the right, or on the not-at-all annoying popup (which you’ve probably already seen) or as a last resort, click this link for a dedicated optin page! You’ll get a colourful and motivational and useful gift! Thanks Alex…a timely message as I’m about to embark on a new venture.